It is difficult, really difficult! Most of us are students with no source of income except for the few amount given as pocket money by our parents. 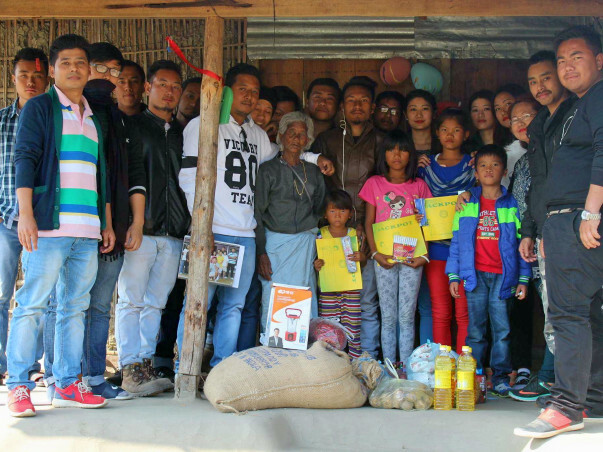 Young Guardians of Manipur has 35 youths from different parts of Manipur united by a common goal of helping the poor and making our society a better place to live in. We get mocked at many a times, some people would mock us ‘Who are you to help others? You don’t even have a source of income for yourself. Try to get a government job first, only than you help others’. Such words ring to our ears often. Due to harsh geographical terrain and other internal issues, big private companies don’t come to our hilly region so government job is the only proven way out to have a better life. Our journey has not been a simple one but that don’t deter us from our common dream ‘A dream of a better society where people care and help each other, where no people have to go hungry or cold due to poverty’. We have been working on Sundays (not on other days so as not to affect our studies) to fulfil our dream. We search for people who are in dire need of help with no one to depend upon and render them with all possible helps from our side with our limited funds and large hearts. The odds against us have push us harder. We want to spread the message of love and humanity in our society. Our belief has taken us to what we are right now. Now, we have built the trust, have made lives better for many families and still going strong. We are not a registered body yet, though we are planning to get registered by February. So, we don’t have any source of funding either from private or government side except for the few donations from generous supporters here and there and our pocket money which we saved every month. 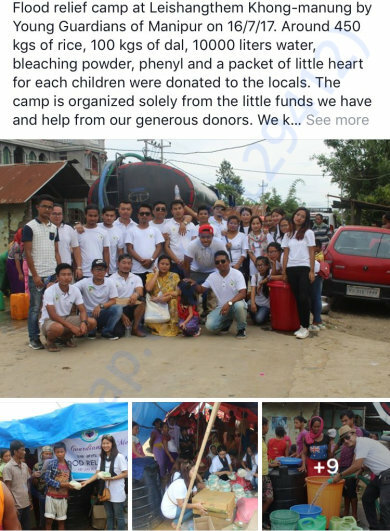 Many have seen our work through our facebook page ‘Young Guardians of Manipur’ and believing that we can help, we are being contacted from all corners seeking our help and we plan to help as many people as possible, touch as many lives as possible. But, the major roadblock has always been the Finance. It is hard to operate with the peanut fund we have. Remind can be made that none of our members take any form of salary or wages for any sort of activities that we perform for the welfare of our society. With the little funds we have, we are making lives better for many. We can achieve much more, help many more if and only if we have more funds which we don’t have at the moment. Moreover, we refuse to take money from shops or person without their consent (and we never will). We want people with large heart to help us whole heartedly. So, it is our humble request to all the generous people seeing this post to kindly help us with monetary donations no matter how big or small it is. We met an old woman named Ibempishak who is around 85 years old. She picks up bottles from streets and sell them to earn a meagre 30-50 Rs. Per day to feed her three granddaughters who are 7 yrs, 10yrs and 13yrs old they were left under her custody after her only son died in an accident and the mother of the three left the girls without a word. Ibempishak narrated with tears in her eyes how the heartless mother left the youngest girl Babynao on ground so that she would die when she was 5 months old. Ibempishak picked her up and has been taking care of Babynao and the other two girls tirelessly. We have visited and help them many a times with regular supplies of food, clothes, books and even built a sanitary latrine for them which was abok’s only wish as she told us with the donations we get from our generous donors through Milaap. We still visit them from time to time and their neighbour would call us when any girl is sick. Chaobi has three daughters who are 12 yrs, 8yrs and 6 yrs old. Her husband was a rickshaw driver who died after vomiting blood a few months back. The youngest girl is mute. The girls were infected with skin diseases when we first met them. Chaobi works in a rice hotel and would bring remains to feed her daughters. Many a times she would go hungry after eating one or two spoonful so that the girls can eat more. They live in such an extreme poverty that they didn’t have a water container. Wee lucky enough to gift a 500L water tank. 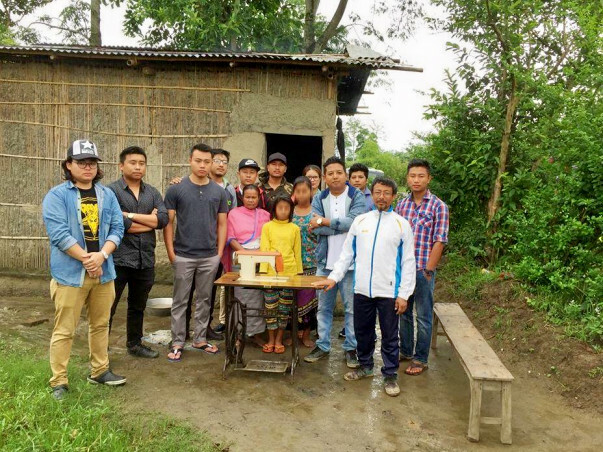 The family of four would spend sleepless night whenever there is heavy rain due to leakage. We have helped them with household items as well as cash. Yaima is a 60 yrs old grandmother who was left alone to nurse her two granddaughters. She works in a brickfield at Lamsang, Manipur as a sole breadwinner. Yaima narrated us how she had to struggle when any of them fell sick as they couldn’t afford to pay for treatment. The elder girl had to leave her study after she was on bed for around 1 year due a serious illness. Yaima borrowed Rs. 15,000 to give her treatment. She has been working hard to pay off the debts till now deducting from her daily wages. We don’t have enough money to pay off the debts. We had some other plans after asking opinions of Yaima and her elder granddaughter. We have admitted her in a 6 months embroidery program, all expenses paid from our side and even provided her with a bicycle to travel to her training centre and an embroidery machine so that she can practice the profession. These are a few of the families we have helped so far. There are many other families which we have rendered our help. We are never shy to lend our helping hand to those in need as long as our resources permit. 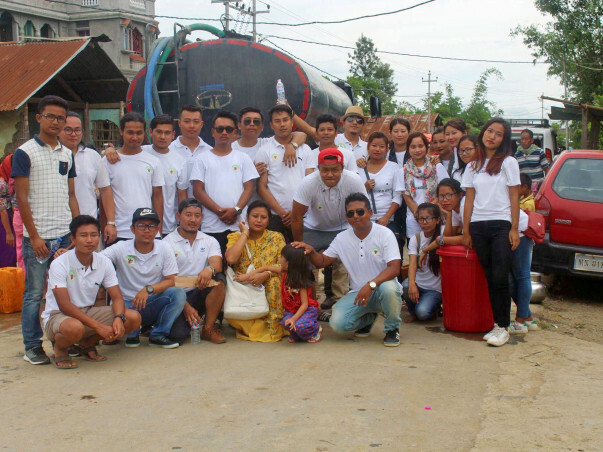 We have even conducted flood relief camp at Thoubal district, Manipur distributing 450kgs of rice, 100kgs of dals, 10000 L of water and other necessary items like phenyl, bleaching powder, etc. We visit old age homes and orphanages from time to time with foods, clothes and other basic amenities. This all is possible because of God’s blessings, the immense love people have shown us and hard work of our volunteers. Currently, we are starting our scholarship program which will be offered to three students hailing from below poverty line. One student will get 12,000/year and the other two will get 4000/year. Abok(grandma) Moirang Huidrom, 72 yrs, from Wangjing Khunou, Manipur has none to look after her. Her husband died a few months back due to health issues which were never treated. Her land along with the house were taken away because of a few sum she borrowed due to some urgency. Now, she has no place to live. She sleeps in neighbour's veranda in this chilly weather, where temperature drops below 8 'C in this hilly region of North Eastern India. She has health issues which are undressed and untreated but she is not concerned about the health issues, all she cares is having enough food to survive and a place to sleep for the day. Unfortunately, she can't even walk properly due an accident she met some years back while working as a labourer. She would sit in front of hotels and beg for food from generous passer-by. Our first meeting with her was on 3rd June, 2017, when a concerned member of her locality approached us to help her. Since then, we have been visiting her frequently, with foods, giving her health check-up. Abok's last wish is to have a place, a home to live in, where she can die peacefully. We convinced her to live longer, healthier and gave her the hope that she is not alone, we promised to build her a small shelter with a warm bed where she can sleep and rest peacefully and happily. We are working hard to build a cosy place to live in for her. And, we can't do this alone. We need help from generous people like you to fulfil her last wish. She doesn't need a fancy house, all she needs is a place which she can call of her own. Another incident is Golmei Lankonchung, 64 yrs, from Langthabal Khoubum, Manipur. His wife who is 44 yrs. old is the sole bread winner of the house. She cooks local wine for a local shop for a meagre 40-100 Rs. a day to feed family of 5. Golmei has been bedridden for the past 2 years due to uncontrolled Diabetes and Cataract issue (right eye blurred, left eye blind) and also has case of tuberculosis. The small amount his wife earns can't even suffice to provide square meals a day for the family of 5, so giving him treatment was out of question from the beginning. They have to skip meals many a times sacrificing their share for the hungry kids. His two wishes are to restore his health and help his wife again in running the family & getting his vision back to see his family again. Having no money for treatment, he had almost given up hope and was waiting for his last breadth until we met him. We have been treating him at JNIMS hospital, Manipur for the past 4-5 months conducting test after test and giving him regular doses of medicine. His health is improving well. We are planning to operate him once his Blood Sugar level (above 500) goes down to operable level so that he can have his vision back. We will continue with our mission to help people in need against all odds. So, it is humble request to all the generous people to help us in our effort to lend our helping hands to the poor by donating in our fundraiser. We can’t do this alone we need your help. Let us join hands and make this world a better place. 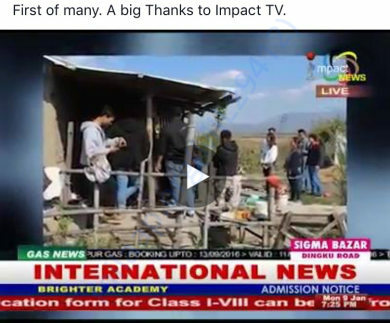 Featured on Impact tv news. Thank you so much for all your love. We couldn't have done this without you. 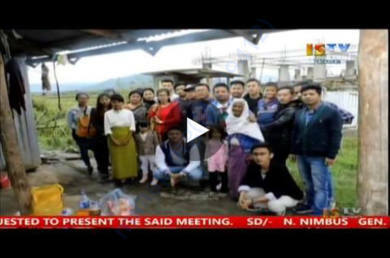 We have made monetary donation to a family in Khurai,Manipur. The patient has been bedridden for past year. His father is a rickshaw driver and it is very hard for them to treat her. We have also selected 3 students from very poor family who excel in studies in their respective schools. We will be giving scholarship of Rs.6000/year to two students and Rs.12000/year to one student. Please keep supporting us so we can make this world a better place. 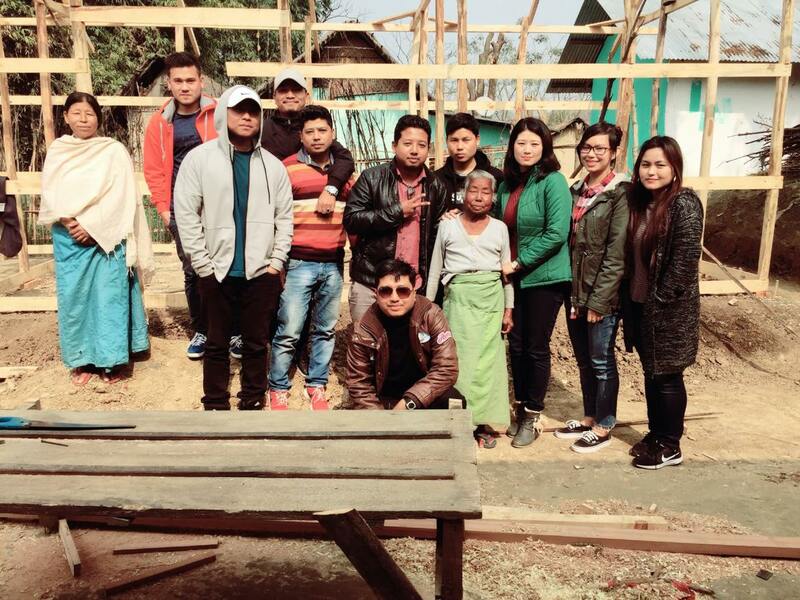 Our members with abok Moirang in front of the house that is being constructed for her. This won’t have been possible without your generous donations. As we are undertaking many other projects, touching more lives, we are in dire need of more funds. So, please kindly share our fundraiser link to your griend circle. Thanks in anticipation.